Rotational/Rearrangement puzzles are quite common to see. But how many are made by Jürgen Reiche's company Siebenstein-Spiele? This German puzzle manufacturer makes gorgeous puzzles at an affordable price, which in my book is always a plus. Their presentation is always something to contemplate, as they use different wood colors, many times in combination with acrylic, for maximum visual impact. Spinning Wheels is a very nice puzzle that appears to be rather easy to do, but still can transform into an interesting challenge. Rotational/Rearrangement puzzles use basically the same logic as a Twisty Puzzle (Rubik's Cube), only it's presented in 2D. If you have experience solving cubes and other twisty puzzles this won't be too difficult, but fun is guaranteed. 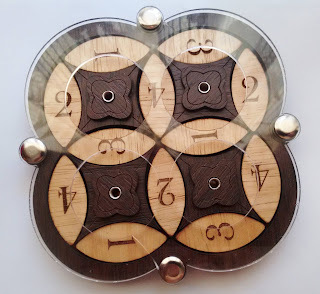 The puzzle features four overlapping wheels, each with four numbers, and each sharing two numbers with its adjacent neighbors. 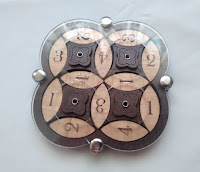 The idea is to rearrange the wheels so that each one shows the numbers from 1 to 4 in sequential order and counter-clockwise - Not sure if clockwise is solvable. 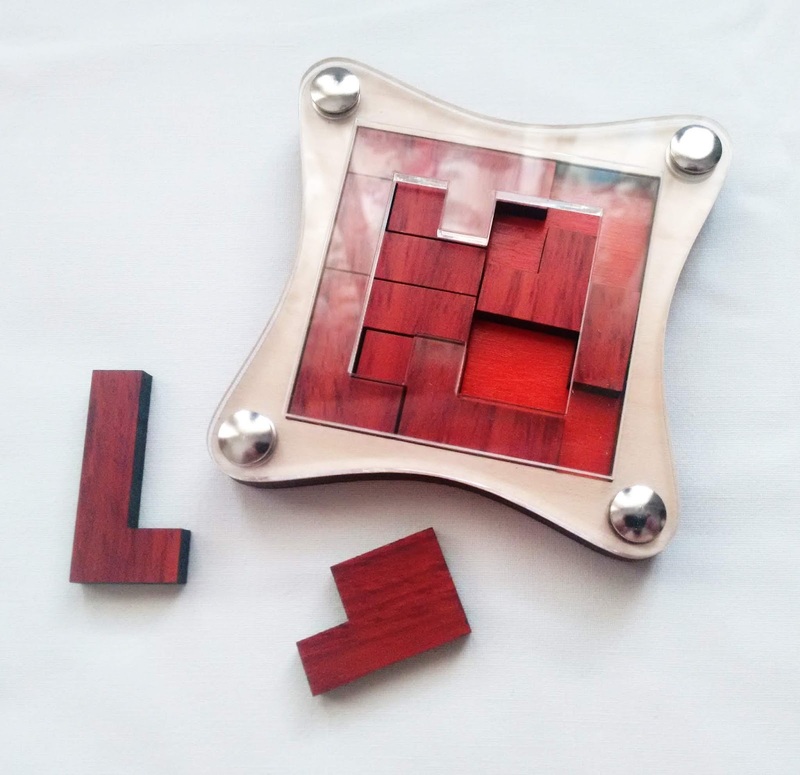 If you tried a similar puzzle before, you know that you need to have the wheels properly aligned to have smooth movements, which is not always achievable, since the pieces are a bit loose. To be fair, a puzzle with tight movements also jams, so it's something you have to live with when dealing with mechanical puzzles. Overall, it has a satisfying movement. As previously mentioned, this is not an easy puzzle to solve. It's rated as a level 9/10. By nature, Rotational/Rearrangement puzzles are always difficult, so that's a given. But in general, as far as this type of puzzle is concerned, it's not the most difficult I've encountered in this category. Took me about half an hour to solve it. If it had a couple more wheels, then it would have been one hell of a challenge. As it is, I'd rate it a 7/10, and not more. Spinning Wheels by Siebenstein-Spiele is a great introductory puzzle for the Rotational/Rearrangement category. It's challenging enough to prepare you to other, more challenging puzzles. As an added challenge, try to get each of the four numbers in groups, instead of sequentially (like 111, 222, 333, 444). Availability: Spinning Wheels is available from PuzzleMaster for just $29.99 CAD. Siebenstein-Spiele also has many other interesting puzzles on offer. Eingeengt 2 was designed by Jean Claude Constantin and, as you might've guessed by now, this is the second design of this type. You can check out my review for that one from six years ago. Back then, I loved the idea and concept of the constrained puzzle, and this time it's no different. It's a really clever design, which defines what a great challenge should be. The new design features seven pieces, one more than its predecessor, and a different way to constrain the pieces. The acrylic cover of the frame has a shape cut that only lets one piece at a time to be fitted, and even then, you must slide the already fitted pieces around so that it allows for the remaining pieces to be placed. The solution is sequential, and only a careful planned strategy will solve it. The puzzle is rated as a level 8/10, like its predecessor, but to my experience this one is much more difficult to solve. It's at least a level 9/10, in my opinion. It has a higher number of moves and the one extra piece is enough to exponentially raise the overall difficulty. Despite it's higher difficulty, Eingeengt 2 is a superb puzzle. It's not like many other packing puzzles where the solver attempts to solve it at random. There's a logic solution behind it that must be discovered, and that makes the puzzles quite fascinating. A must for experienced puzzlers. Availability: Eigeengt 2 is available at PuzzleMaster for $18.99 CAD. 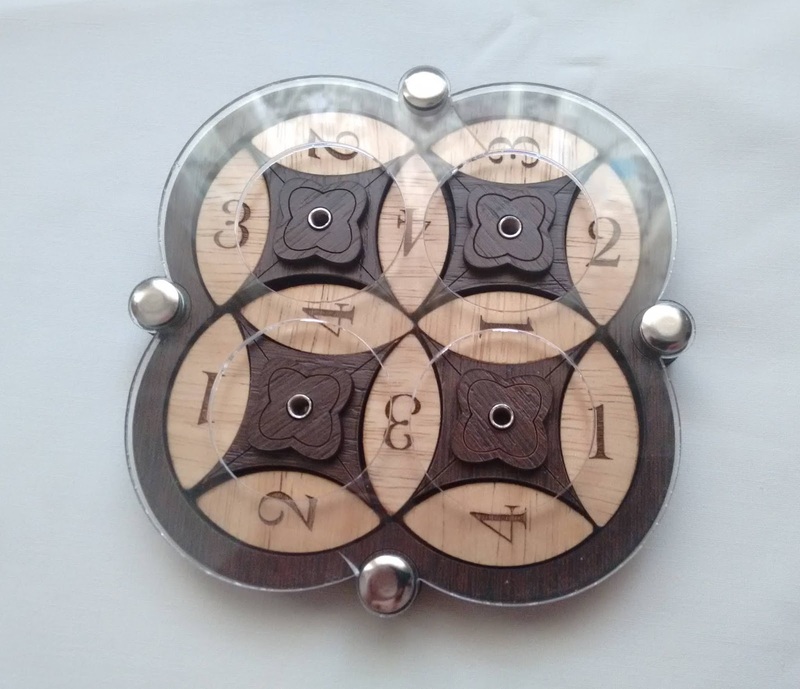 Many other interesting puzzles from Constantin are available. 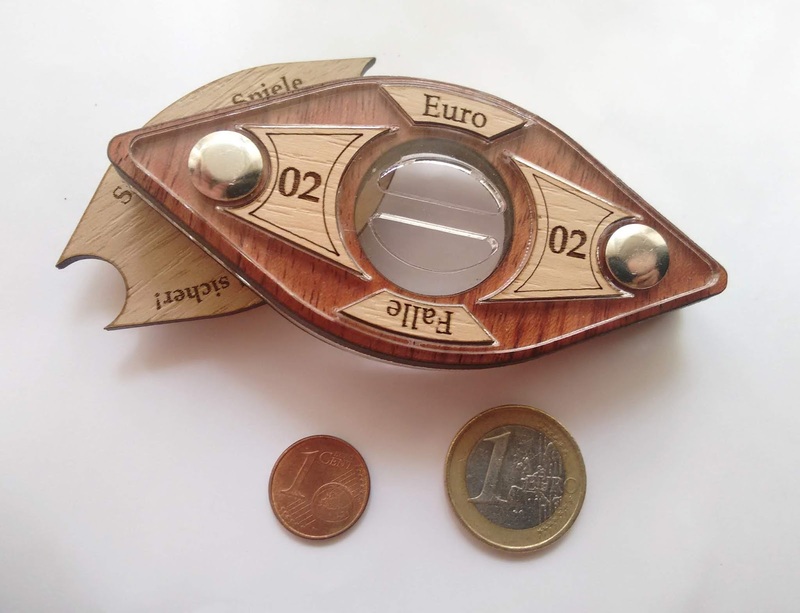 After having reviewed the first in the series of the Euro Falle puzzles, this time I concentrate my efforts toward the Euro Falle 02, a lovely trick puzzle with a hidden mechanism. 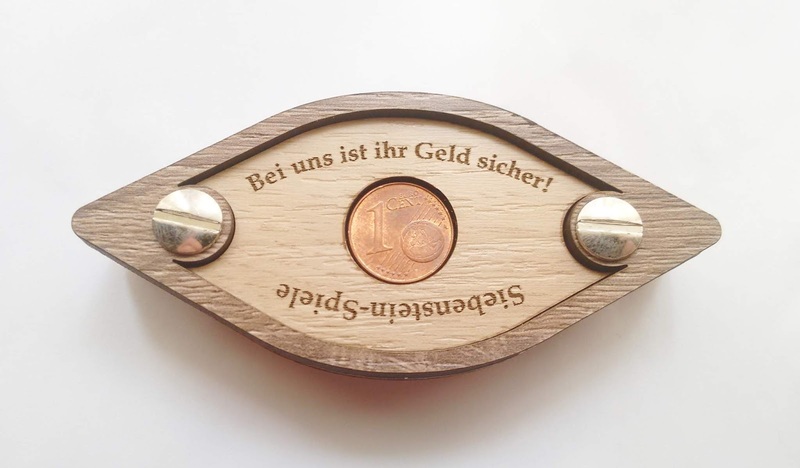 Designed by the founder of Siebenstein-Spiele, Jürgen Reiche, this is yet another one of his genius creations, which I'm sure you're gonna love it. Slightly bigger than its predecessor at 9.4cm x 4.3cm (3.7" x 1.7"), the Euro Falle 02 is still a tiny puzzle, but the challenge it will give you will be anything but that. Even though this is rated with the same difficulty as the first puzzle (7/10), I can definitely assure you that's not the case. It's at least a level above, which I'm sure you'll find out once you discover its solution. 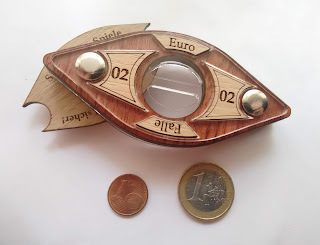 As mentioned in my previous review, there are at least six different designs for the Euro Falle puzzle, each with a different hidden mechanism that keeps a coin trapped inside. So far, this is only my second puzzle in the series, so the comparisons will have to be made with just the first one, which I already solved. Design-wise, I prefer the Euro Falle 02, because it has a nicer overall appearance and shape. The difficulty has increased, but so has the elegance of the solution, which is among the best I've seen in any hidden mechanism, not just by a Siebenstein-Spiele puzzle. I really loved the solution. I discovered it by accident, just by inspecting it and fidgeting with it, which will happen naturally if you don't give up on it and keep insisting on studying every detail about it. It's such a clever design. 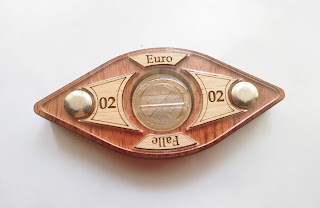 Euro Falle 02 is a fantastic puzzle. At first sight it looks like nothing moves and it's impossible to remove the coin. However, the beauty lies in discovery and happy accidents (Bob Ross pun). 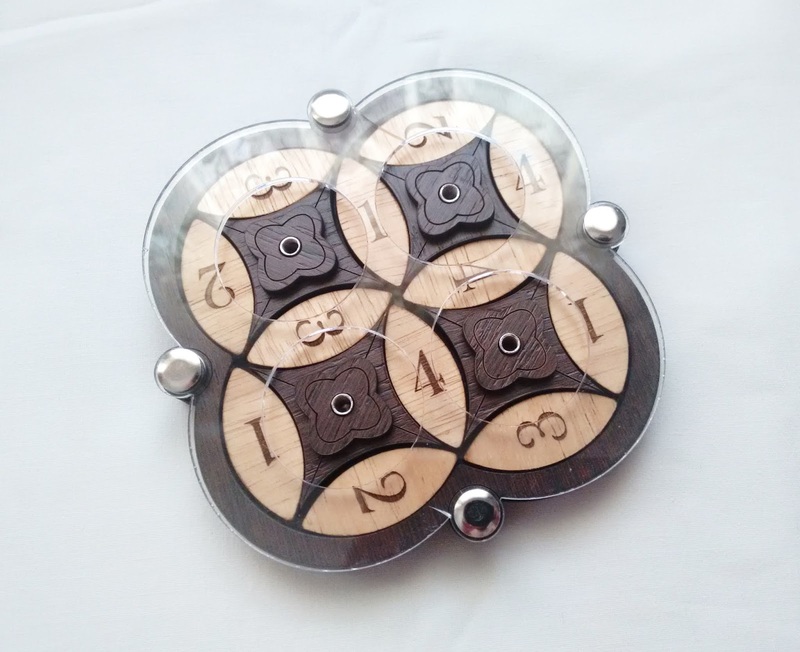 I highly recommend this one, especially if you're into hidden mechanism puzzles. Bravo, Jürgen! 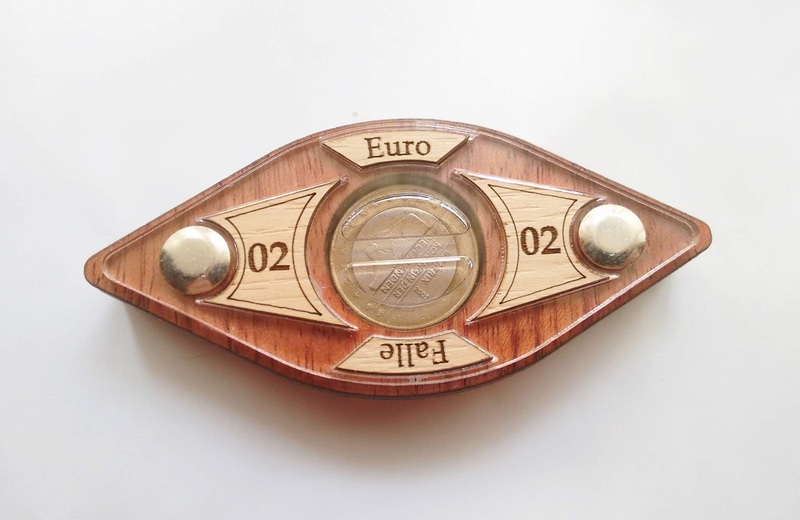 Availability: The Euro Falle 02 is temporarily out of stock at PuzzleMaster, but do check back again soon, as it will surely be back in stock in no time. In the meantime, you can browse other great designs and creations by Siebenstein-Spiele.